From everyone at our maternity clinic in Calgary to you: Congratulations! As you await the arrival of your baby, you want to find the best maternity clinic in Calgary for your needs. 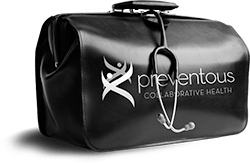 At Preventous, we understand the roles of good medical care, healthy eating and physical fitness in maternity care. Our goal is to help you have the healthiest pregnancy possible. Clinic staff includes physicians, nurses, nutritionists and fitness experts who will help you have the best pregnancy possible and give your baby the best start in life. We strive to give a high level of pregnancy care in Calgary. That’s why members of our Twenty-Four Seven Club™ can visit our maternity clinic on their schedule during regular office hours, allowing you to get the best care during your pregnancy while juggling all the other demands of work and life. As a member, you also have access to your physician 24 hours, 7 days a week for urgent care concerns. And your new baby automatically becomes a member with free access to these services. At our private maternity clinic, our members receive expert advice and assistance with their fitness and nutrition needs. Your registered dietitian, Fabijana Jakulj, works with you to help you stay on track with your weight gain. You’ll also learn about the foods that can help your baby develop healthily and the foods you might want to avoid. After your child is born, your dietitan will help you develop nutrition plans geared toward your needs, like plans specifically for breast-feeding. Working with your dietitan and physician, you can start today to develop healthy eating habits for you and your new baby that will last a lifetime. Regular exercise is proven to help women manage the stress of pregnancy, take care of their bodies, and prepare for the birth. Your kinesiologist will create a physical activity plan for your pregnancy, taking into account your physical limitations and restrictions as well as your personal preferences and needs. After the birth and your recovery, your plan is adjusted to aid with post-pregnancy weight loss and increased energy to keep up with your new little one.